When it comes to boatshoes, we find ourselves turning to A/O’s more times than not, and now with custom options available, it’s going to be even harder for others to break into our rotation. 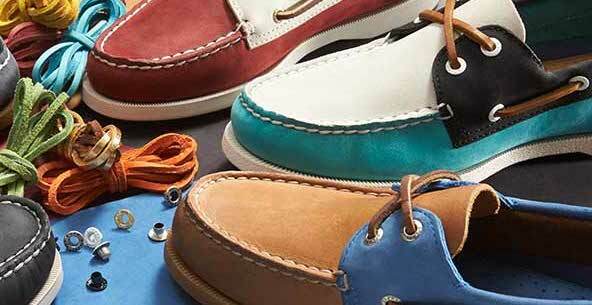 What we love about Sperry’s first foray into the world of customization is that they went all in. Literally, you can choose the leather color you want for every single panel of the shoe, as well as pick your favorite lace color, hardware, and thread. They’ve also added a monogram option. If you really want something one of a kind, you can go all out with a limited edition hand drawn shark “tattoo” across the toe box courtesy of tattoo artist Rob Hotte. Whether you go all out with crazy colors, or just make a small tweak to your favorite classic Sperry color combination, a pair of custom A/O’s will make a fantastic addition to any boatshoe rotation. Yes, even if you can’t wear them for another few months.